» Emails going to spam? For most mail services, you'll be fine if you add mail@myfutureself.com to your "address book" or "contacts". 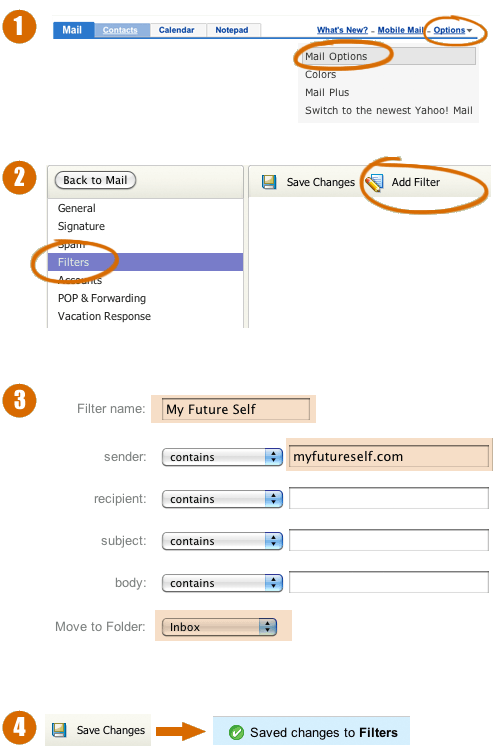 For some mail services, you might set up a filter whose rule is "never spam emails from ______@myfutureself.com"
For Microsoft Outlook, you can add mail@myfutureself.com to your "Safe Senders". Search for a My Future Self email in your Spam folder. If you find one, then open it and click the Not Spam button. Type mail@myfutureself.com into the box for "Other E-Mail"
Next, check if mail@myfutureself.com is on your Blocked Senders list. If so, click the corresponding Remove button. You might also check out this article, from which a number of the whitelisting tips on this page were researched.